Back to basics today with miso soup! 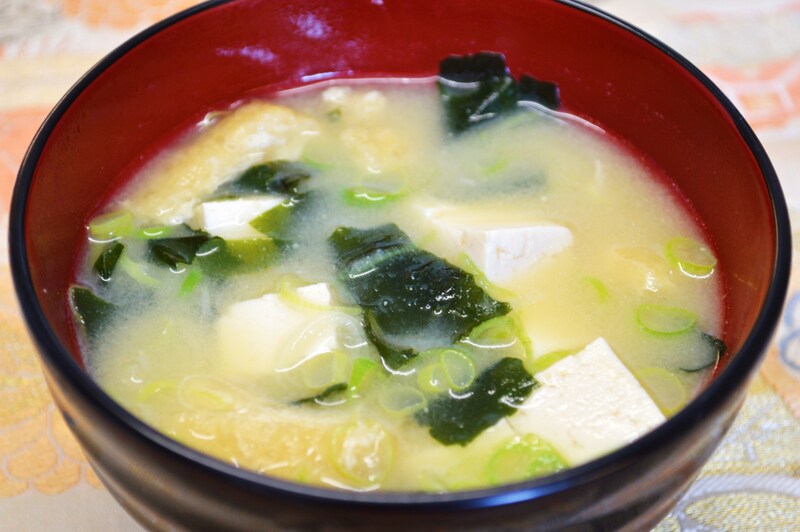 Miso soup is an essential part of the Japanese meal – Japanese people often even drink it at breakfast! It should be served alongside the main meal (not before like western soups). You can put almost anything in a miso soup and it’s good anytime of the day, anytime of the year! Here’s a recipe for a big pan of miso soup that will serve about 4, but you can also just make a little one for yourself. Many supermarkets now sell individual miso soup packets and all you need to do is add boiling water! Miso soup is souper versatile so you can substitute the ingredients if you don’t fancy the idea of aburaage! 1. Prepare dashi and bring to the boil (or just use boiling water). Turn down to simmer and mix in the miso paste. Gently stir to get rid of lumps. 2. Finely chop spring onions. 4. Cut the tofu into smallish cubes. 6. Add spring onions, abura-age and wakame. Add the tofu last so it doesn’t lose shape and become full of holes. Warm through gently. 7. Divide soup into bowls and serve hot alongside main meal. 8. You can use other ingredients if you prefer.